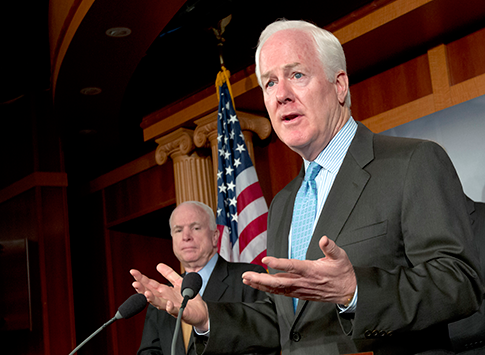 Sen. John Cornyn (R-Tex. ), the Republican whip, told me in a phone interview this morning he would oppose the nomination of Chuck Hagel as secretary of defense: "I can’t support a Hagel nomination if it comes," he said. He is the first senator to expressly state he would oppose Hagel. He told me he thinks there would be substantial opposition to Hagel on both sides of the aisle. "I’ve heard prominent Democrats concerned about his position on Israel. Many Republican have said they did not want to prejudge. But it would be a bad move and one of the reasons I’ve taken the position [to oppose]. ‘Mr. President don’t do that. It would be a bad nomination.’"
"He appears to believe [a nuclear-armed] Iran can be contained. [ Defense Secretary Leon] Panetta and the president have said a nuclear weapon is a red line. He’s not even consistent with the secretary of defense and the administration." A number of Senators have expressed concerns about Hagel's foreign policy positions in recent days, including Sens. Kelly Ayotte (N.H.), Dan Coats (Ind. ), and Pat Toomey (Pa.). This entry was posted in Politics and tagged Chuck Hagel, Congress, John Cornyn, Obama Administration. Bookmark the permalink.